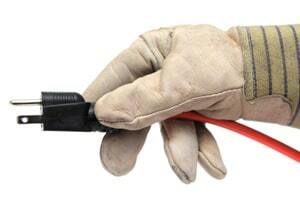 Electrical safety is key to prevent fires, injuries, electrocution and potential death. Take a look at possible electrical hazards on your farm by starting with this checklist. Where could electrical hazards be “hiding” on your farm? Are all electrical outlets grounded to accommodate (3 wire) appliances and equipment? Are electric wires firmly supported or in conduit? Are all electrical cords in good condition (not cracked, broken or brittle)? Are stationary power tools properly grounded? Can electrical equipment be locked in the “off” position, particularly when equipment is being repaired or serviced? Is a lock available? Are all workers aware of overhead power lines? Are plugs, sockets, and switches in good condition (not broken or with exposed wiring)? Do all workers know how to shut off the power in case of an emergency? May is National Electrical Safety Month, but it is important to keep safety at the forefront at work and home year-round. Each May, the Electrical Safety Foundation International (ESFI) commemorates National Electrical Safety Month (NESM) to raise awareness about critical electrical safety topics and the steps that can be taken to reduce the number of electrically-related fires, fatalities, injuries, and property loss. The ESFI website contains a variety of resources including fact sheets, safety tips, publications, and a website dedicated especially to kids safety.